My boys love breakfast items made with pumpkin. Pancakes, waffles and now cookies! Plus these cookies are wheat-free. So for anyone that’s looking for gluten-free recipes, you have to try this one. A quick search last night turned up a few recipes for “pumpkin breakfast cookies.” I browsed them and looked over the needed ingredients before settling on this one from a blog called “From the Little Yellow Kitchen.” The photo above shows how mine turned out. Plan on about 15 minutes of prep time and then 13 minutes of bake time. Preheat oven to 350 degrees F. Line a baking sheet with parchment paper or a silicone baking mat. Set aside. Alternatively, you can lightly grease mini-muffin cups and baking cookies in there. Make oat flour, by grinding about 1 1/4 cups oats in a food processor, until finely ground, about 1-2 minutes. In bowl of stand mixer, combine pumpkin, egg, and vanilla and beat until well combined. In a separate bowl, combine oat flour, oats, maple syrup, sugar, baking powder, baking soda, spices, chocolate chips, and dried cranberries. Add the dry ingredients to the wet ingredients and mix until just combined. The cookie dough will be thick. Using a small cookie scoop, drop about 1 1/2 Tablespoons of dough onto prepared cookie sheets or mini muffin cups and slightly flatten to the shape you want your cookie, as they won’t move much in the oven. Bake for 13-14 minutes until lightly browned. Allow to cool on the cookie sheet for a couple minutes before transferring to a wire rack. Cookies will stay fresh at room temperature for 4 days in an airtight container, or for about a week in the fridge. 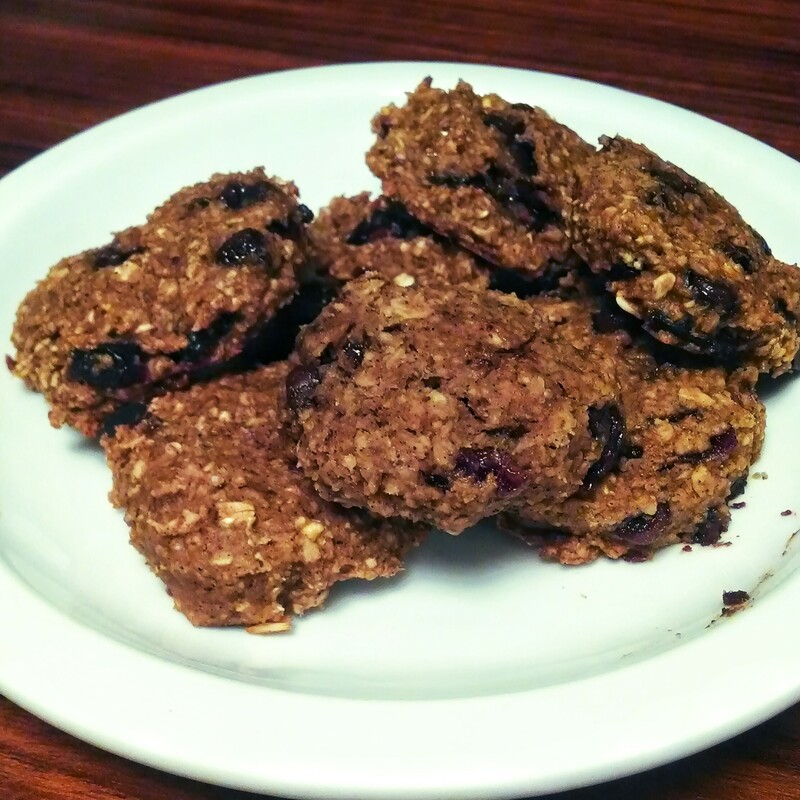 This entry was posted in Main, Recipes and tagged cookies, glutenfree, kidfriendly, recipes. Bookmark the permalink. ← Morning Coffee – How About Some Corn Syrup Solids? I recently tried a pumpkin baked oatmeal and loved having that on hand for breakfast. This recipe would be so cool to have on hand as well. I might skip the chocolate chips but cranberries would be a super match with pumpkin! Thanks for the idea! Hope you enjoyed them Audrey! We did.